TC Helicon's latest live vocal processor squeezes plenty of powerful processing into a 2U rackmount space, and comes with a free microphone too. TC Helicon specialise in digital vocal processing, and their range of progressive effects processors goes from simple, preset stomp boxes for casual performers, right up to more complex models such as the VoiceRack Live. This 2U-high, rackmount device is designed to be the peak of TC Helicon's current live vocal processing technology, and combines most of the effects found in their less expensive units into a single device, with some extras. It offers a mic preamp (complete with phantom power), modulation effects, harmonising, double tracking, reverb and delay, looping, equalisation, instrument input, simple guitar effects and more. Once the VoiceLive Rack is switched on, the front panel is dominated by a bright-blue LCD. When you're not editing a patch or navigating menus, this displays the name and number of the current patch, and the current 'step' within that patch. If you have the included MP75 mic connected, it also shows what function the mic control button is assigned to. The screen itself displays some lag, so when you're adjusting parameters that are displayed in a small font, it's tough to see what you're scrolling past without taking things slowly. It is, however, extremely bright and clear when things aren't moving, letting you know just where you are in your library of patches. The majority of the controls on the front panel are of the capacitive touch type, and they respond very quickly to contact, unless you happen to be wearing thick gloves! Parameters on the LCD screen are adjusted using five stepped encoders, one of which is significantly larger than the other four. The smaller encoders adjust the main mix of inputs and effects when you're on the home screen, as well as adjusting other parameters when you're editing patches and options. The larger encoder is used for scrolling through patches, or scrolling within a menu. Power is supplied by a 12V DC adaptor, which is included. I always prefer a standard IEC mains inlet for power where it's possible, though of course that would increase the weight and expense or the rack, as well as the complexity of the internal design. You can see the layout of the rear panel, and all the connections provided in image 2. 2: The rear panel of the VoiceLive Rack houses all the connections, including mic input, instrument in and thru, stereo or mono outputs, digital I/O and MIDI connections. A footswitch can be attached for extra control, while a USB connection facilitates patch management and firmware updates. Each VoiceLive Rack patch can contain any of the included effects. These effects are similar to those found on the VoiceLive Touch (reviewed in SOS October 2011), but can be edited much more precisely, with the kind of in-depth controls you'd find on an equivalent plug-in. Each effect has a selection of presets called styles, including 'No Style', which is effectively a blank starting point. The uMod section provides modulation effects such as flanging and panning, and includes a high degree of stereo, channel-independent control: everything from waveform to phase, and even receive levels from other effects, is covered. Delay and reverb continue this pattern, with plenty of adjustable options. They also include a 'ducking' feature, which reduces the effect level while you're singing and raises it again afterwards, making the vocal sound clear yet still wet. The Harmony, Hardtune and Double effects are all used for various kinds of vocal thickening, creating extra voices from your performance. The Harmony function is the most powerful, and can generate multiple complimentary melodies based on your voice, either using a selected or custom scale, or by detecting the notes and chords played on an instrument in real time, via instrument jack or MIDI inputs. The 'Hardtune' effect emulates the kind of 'Auto-Tune at full' effects you hear in mainstream pop and R&B records, while Double provides various double and quadruple voice effects. Again, each of these effects can be meticulously fine-tuned to match a particular song. Transducer effects let you add distortion and megaphone effects to the voice, for a bit of grit, while the 'rhythmic' section allows you to add rhythmic gating and the like. You can set a BPM speed per patch in the menu, or tap the tempo out 'on the night'. The Wizard button is effectively a search function for presets. You can tag patches with up to three of 24 tags and then search for them, again using up to three tags, to narrow down your choices. Most of the presets have a little too much EQ shaping for my taste, making them sound more 'digital' than they have to, but other than that they're good starting points, and some emulate popular songs rather well. Some of the voice morphing effects actually sound more convincing when you switch a few of the other effects off: the lack of extra artificial EQ makes the generated harmonies easier to accept from an audience point of view. The adaptive compression, de-essing, gate and EQ settings are nice in moderation, adding a little polish to your average dynamic vocal mic. Overall the processing has the signature TC Helicon sound that I've come to expect from their range: clean, modern and effective. 3: The MP75 Modern Performance microphone comes with the VoiceLive Rack. 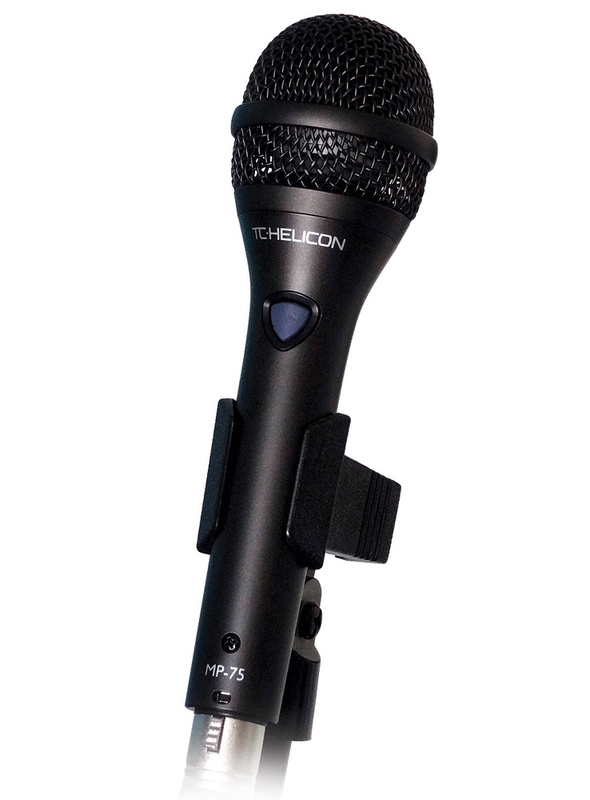 It has a good, clear dynamic tone and features a button to control a designated function on the Rack.The included MP75 Modern Performance Microphone (also available separately for £129$210) is a dynamic mic with a small rubber button. This button sends on and off messages to a compatible TC Helicon product, and a quick check on their web site shows that many of their products can be used with the mic in some manner. The MP75 compares very favourably to the classic Shure SM58, with a slightly brighter, clearer tone that feels, to me, more 'up to date' than Shure's stage stalwart. It has a very similar but slightly quicker transient response too, and compresses the vocal a little less. You're not missing out by opting for the MP75 instead of an SM58, and I actually preferred it with my own voice. When it's plugged into the VoiceLive Rack, the mic can be used to activate or deactivate individual effects, or even to set loop in and out points and layer up a loop performance. The function of the button can be configured globally or (more usefully) on a per-patch basis. If you perform as a dub MC, for example, it makes sense to have control of a delay or transducer effect to hand, which could give you quick access to a feedback-laden dub delay or some megaphone mayhem, respectively. Unfortunately, the mic button can't be configured to move up through the steps in a patch. This would be ideal, since the singer could use it to navigate through a song with minimum distraction. He or she could press it at the start of the bridge to activate the delay, then the start of the chorus to activate reverb, and again at the verse to dry the signal off, for example. Hopefully, this is something that can be added in a firmware patch, as I could see it being useful! The button on the MP75 mic is very rubbery and must be pressed quite hard. This is, of course, a design trade-off of sorts: if the button were very easy to press, it could be activated by accident as easily as it was intentionally. Note that if you buy the TC Switch3 three-button footswitch (£59$59), you can step up and down through patches using two of the buttons, as well as controlling other functions, which isn't a bad solution. The VoiceLive Rack addresses most of the issues I had with the VoiceLive Touch, adding a dry output for monitoring, editable effects patches, and steps withing each patch for changing effects throughout a song. It's capable of creating some epic effects, with the right combinations. One of the most enjoyable that I found during my review time used the 'Arena Chant' preset with some added Hardtune and a rhythmic gate, which turned my falsetto singing into a trance synth! Whether you find the more complex processing useful may depend on what kind of music you perform. If I were in a live dance act of the likes of Pendulum or the Prodigy, I would love to use something like this, transforming vocals for each song. The unit also suits hip-hop and commercial pop sounds: the layers of tuning, reverb, modulation, harmony and transducer effects would fit perfectly. TC Helicon's voice-transformation software is becoming more and more impressive as time goes on, and in the context of a live mix some of the harmony effects — including subtle gender switching — can actually be quite convincing, especially if you adjust your performance to complement the effect. Since it isn't cheap, I'd suggest auditioning the VoiceLive Rack by listening to the examples on TC Helicon's Soundcloud page (see 'Online Support' box), or trying out the unit in a store. If you decide it is for you, you'll find it's a powerful product that enhances tight performance and rewards good planning and programming of patches. Powerful harmony processing can follow an instrument in real time. Patches can contain multiple steps for different song sections. Very nice MP75 microphone included. Needs a lot of setting up for gig use. Including extensively editable effects and the ability to create multiple steps — or sub-patches — within a single patch, the VoiceLive Rack rewards careful programming. The inclusion of the MP75 microphone is a bonus, too, as is the mic's ability to switch effects. As with all such processors, how useful you find it will depend on the kind of music you perform, but those singing commercial pop, R&B or hip-hop styles will be especially pleased with the powerful processing on offer.